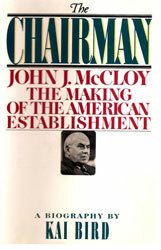 In a 1962 spoof for Esquire, Richard Rovere quoted John Kenneth Galbraith as deeming John J. McCloy ``chairman of the US Establishment''--but McCloy has never been the subject of a full- dress biography. Here, Bird (a contributing editor of The Nation) fills this void with an evenhanded and wonderfully readable account of the public man that also sheds light on the meritocracy whose dedication to principles beyond partisanship still gives it incalculable influence over a presumptively democratic polity. An ambitious, industrious overachiever who made his way from the wrong side of the tracks in Philadelphia through Amherst and Harvard Law School to international eminence, McCloy was notable more for analytic acuity than great brilliance. The upwardly mobile attorney nonetheless left his mark wherever he went. During WW II, for example, the globe-trotting McCloy was Henry Stimson's top aide at the War Department. He later headed the World Bank during its formative years and was High Commissioner of occupied Germany, moving on to the chairmanship of Chase Manhattan. Though a staunch Republican, he served as an advisor to JFK, LBJ, and their successors, while remaining a leading light of the Council on Foreign Relations--an establishment citadel if ever there was one. Although a pillar of rectitude, the pragmatic McCloy did not eschew expedients. He played a key role in the internment of Japanese- Americans after Pearl Harbor, for instance, and granted clemency to scores of convicted Nazis during his tenure in Berlin. When he died early in 1989, a few weeks short of 94, however, McCloy was fittingly eulogized for his substantive contributions to the public good. An impressive narrative history that records a consequential individual's shortcomings without tarnishing his accomplishments. Despite a paucity of personal detail, the absorbing text (ten years in preparation) will likely be the definitive life story for decades to come. -- Copyright ©1992, Kirkus Associates, LP. All rights reserved. An exhaustive, controversial, and moving volume that has its origins in the Smithsonian Institution's cancellation of a planned exhibition in 199495 of the Enola Gay, the plane that dropped the atomic bomb on Hiroshima. To be included in the exhibition's script were several scholarly studies and a number of historical documents that questioned the military necessity and moral legitimacy of that act. The book, then, moves along two paths: a painstaking analysis of how and why the bomb came to be used, and a provocative deliberation on what the editors (Bird, a contributing editor of the Nation, and Lifschultz, former South Asia correspondent of the Far Eastern Economic Review) term the ``pathology of denial'' in the US surrounding our use of the bomb. 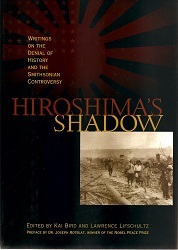 While voices in support of the bombing of Hiroshima are to be found here, most of the contributors in various ways attempt to debunk the myths and assumptions that have built up concerning this act. The first part of the book offers selections by present-day historians. The second part is devoted to essays written shortly after the bombing. Part three focuses on the Smithsonian controversy itself. Part four presents chilling first-person accounts of the day Hiroshima died. The final part is devoted to historical documents, memos, and diary entries of those who participated in the decision to use the bomb and also public statements pleading against this decision. As a century of extreme barbarism draws to a close, the editors ask us to think critically about the US contribution to this barbarism, the unleashing upon the world of atomic and nuclear weapons. Their purpose is not to apportion blame, to point fingers, but rather to allow us to look at our history and perhaps gain what is often so elusive: wisdom. (8 b&w photos) -- Copyright ©1998, Kirkus Associates, LP. All rights reserved.